0. Preface – Dr Ove Bratland Systems Pte. Ltd.
Albert Einstein’s wisdom regarding preventing problems before they occur certainly makes sense in pipeline and pipe network projects. 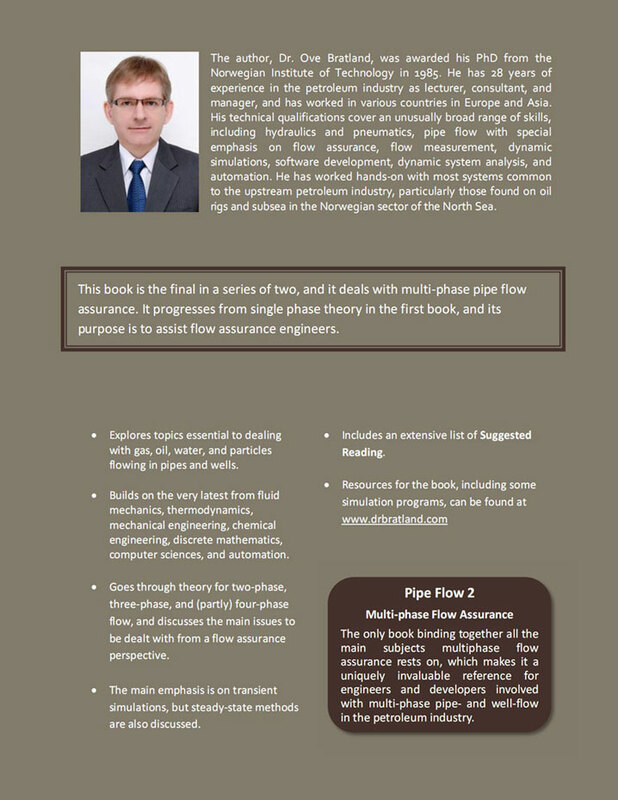 Flow assurance – making sure the fluid flows as intended – relies heavily on mathematical models and the simulations they enable. Simulating the flow and everything affecting it contributes to problem prevention and efficiency, from feasibility studies through detailed engineering to operation. Ever more pipelines are being built around the world, and the number of people involved in various pipe flow calculations seems to increase daily. It is my hope that this book can be of help to everyone engaged in those tasks. There are many commercial simulation tools available on the market, and the variation in user friendliness and underlying theoretical foundation for the various programs are astonishing. The purpose of this book is to explain how pipe flow simulation programs work and how to check results they produce. It goes into enough detail to enable the reader to create his own simulation tools and it also explains how to select and use commercial programs. It demonstrates some common sources of errors and how to avoid them. Pipe flow is a complex phenomenon, and there have been a lot of new, valuable developments lately. Recent advancements come from such fields as fluid mechanics, mechanical engineering, chemistry, numerical mathematics, software development, control theory, and standardization. It is a challenge to keep up with it all, and this book intends to make the effort more manageable. The task is as much as possible seen from the engineer’s point of view, and I have tried to avoid going too deep into details in the underlying theory. Pipe flow problems can be categorized according to what sort of fluids we are dealing with, such as liquids, gases, dry bulk, or a mixture of several of them. This book is primarily about single-phase flow, meaning it focuses on pipes carrying either a liquid or a gas, but not both at the same time. It is still taking multi-phase flow into account in two important respects, though. It includes multi-phase simulation programs in the overview over different relevant commercial software tools in chapter 1, and it uses mathematical models very similar to the ones used for simulating multi-phase transients. For readers who progress to multi-phase transient flow, the added equations required to do so will appear as a natural extension of the theory in this book. In a typical pipeline project an oil company may be the project owner, while a contractor is used to carry out various phases of project execution. The contractor may do simulations in-house as part of this process, or he can sub-contract it to a company specializing in flow assurance. Results coming out of such simulations need to be verified as reliably as possible. Traditionally, this is done by using several subcontractors to do the same simulations and compare results. That can be very useful, but there are other, less well known ways of verification as well. A number of convenient verification tests have been presented in chapters 7.4.2 and 14.6, some published for the first time. The tests are meant to be useful to everyone involved in checking simulation results, including those who carry out the simulations in the first place. Given how easy some of the checks are, it does in fact seem natural to make such verification part of the contractual requirements. A pipeline’s capacity is one of the most important parameters in any design specification, and it is crucial to determine the friction accurately in order to meet that capacity as cheaply and reliably as possible. The most accepted way to determine the friction factor has been to use the traditional Moody diagram or the AGA calculation method. This book demonstrates that these traditional methods easily lead to 10 % inaccuracies in the pressure drop calculations, in some cases significantly more. The traditional friction calculations suffer from two main weaknesses. First, they rely on measurements which do not stretch into as high Reynolds numbers as one may encounter (in high pressure export gas pipelines, for instance). Second, they rely on summarizing everything to do with surface texture into an ‘equivalent sand grain roughness’. An overwhelming amount of measurements show this not to give accurate results in part of the relevant Reynolds number range. Recently published measurements also show that coating can have significant effect on capacity, so much so that internally coated pipelines can achieve the same capacity with a significantly smaller diameter than similar uncoated pipelines. A large part of the book, all of chapter 2, is dedicated to showing how friction factor accuracies can be improved. Previously un-published diagrams are also given there. Some of the proposed methods rely on carrying out measurements and can be quite costly. When expensive pipelines are to be built, though, it makes sense to go into great detail regarding friction, and even early-phase laboratory measurements can be cost-effective. The method of characteristics is probably the most used simulation method for liquid flow. It is fast, simple, and well known, but not directly applicable to gas flow. Chapter 7 outlines which simplifications the method of characteristics relies on, how to implement it in a computer program, and how to calculate steady-state starting values. Many steady-state methods have been developed over the years, but this book outlines a previously un-published method utilizing the transient simulation program modules to simplify the overall computer code. 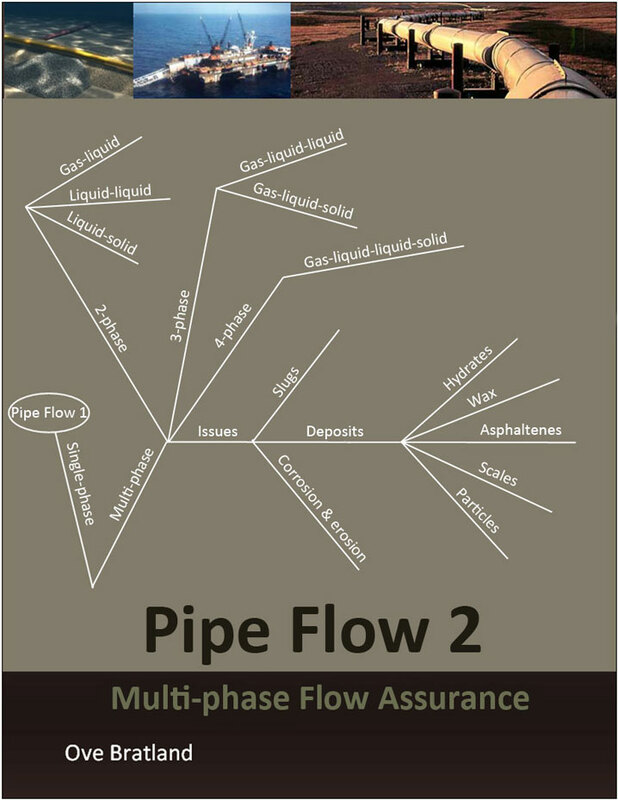 Most books about transient gas pipe flow focus exclusively on how to simulate perfect gases. Real gases differ from perfect gases is some important respects, and perfect gas models are most useful as a reference for testing out simulation methods or for very low pressure pipes. Perfect gas models cannot be used in general simulation programs intended for both high and low pressure pipelines. Therefore, all gas theory in this book is developed with reference to real gases, and ideal gas models are used for reference or testing purposes only. The fully transient gas model presented in chapter 10 uses the Kurganov-Tadmor scheme of order 2 in combination with an explicit fourth-order Runge-Kutta method to solve the conservation equations. The main focus is on how easy these methods are to use in practice rather than on presenting all the advanced theory they rely on. The KT2 method has been around for nearly ten years, but the high-order, causality-safe ways of dealing with boundary conditions and ghost cells outlined in chapters 12 and 13 has to my knowledge not been published before. The new methods make traditional simplifications redundant in some cases. Avoiding model simplifications increases the results’ validity and applicability significantly. Finally, some words about how both books are published. The traditional way of publishing goes via one of the established publishers, with all their resources for checking, editing, marketing, and sales. To most advisers’ dismay, I have chosen not to follow that path. New technology makes it possible to handle most publishing tasks efficiently in alternative ways. Besides, the time when a book’s content was married to the paper on which it was written is long gone, and the cost of making extra digital copies is zero. So why not let unpaid students get a digital copy for free. Orders for printed copies can be made at the internet site www.drbratland.com. Some of the simulation programs used in the examples can also be found there. Any feedback from readers is greatly appreciated and should be directed to the internet site. All will be read, and as far as time allows, serious questions and comments will also be answered. Some misprints have been corrected and a few minor modifications implemented. I have also decided to loosen the restrictions on commercial use of the free version. It is now allowed, but distribution to others requires written permission. For the sake of keeping track of where and how widely the books are being used, I expect each user to download his or her own free copy. Self-publishing via the internet, the somewhat experimental alternative I reluctantly chose after considering various options four years ago, has led to a lot of inspiring feedback. I get daily emails from students and various people in in the oil and gas industry, and the books are now obviously in wide use. I sometimes joke that the theories economist have taught us imply zero price should lead to infinite demand. 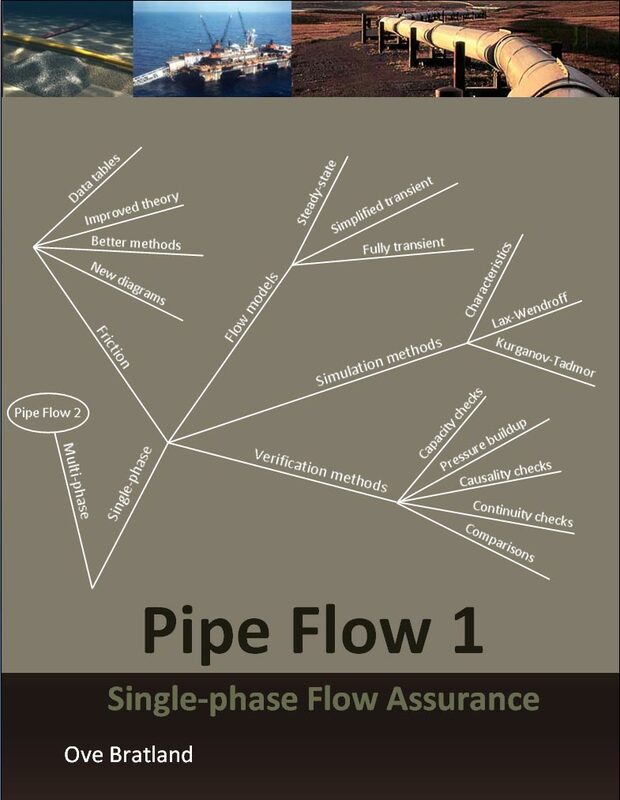 The internet site’s download statistics tell me the pipe flow books are not quite that popular, but a considerable part of the courses and presentations I have been called to hold at universities and industry organizations the last years are clearly a direct consequence of the books. Making them so easily available via the internet has in this respect surpassed my expectations, and I’ll recommend other authors consider the same alternative.